Wissy's blogspot: A "Lush" of Lifeguards? We have just been visiting South Wales (more in another blog) seeing old friends and whilst walking along the beach at Langland I took this picture of a group of young lifeguards. 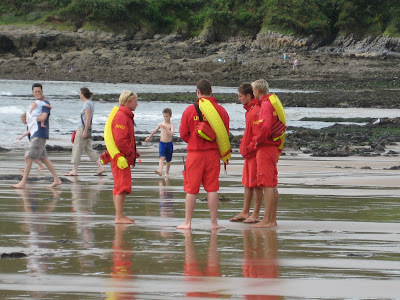 Lifeguards on Langland Bay beach. Following on from my search for the perfect collective noun for a group of blondes,I wandered what a group of lifeguards would be called. My friend's teenage daughter, finding the group of men very attractive and "hunky" came up with the term "Lush" which in modern young English speak I am reliably informed means good looking and desireable. So a group of young lifeguards is henceforth known as a Lush of Lifeguards! Unless, you blog reader can come up with anything better.